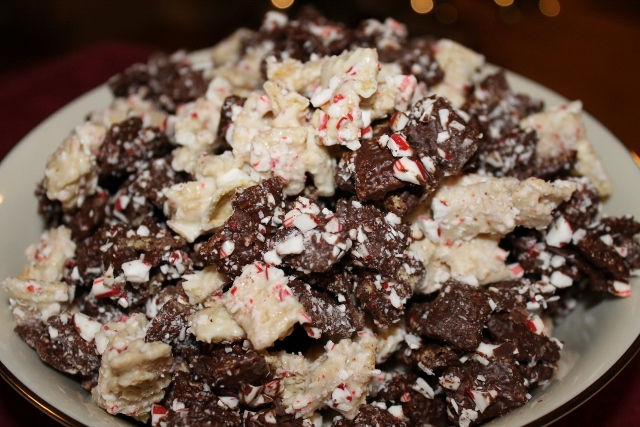 I wanted to make a treat for my family to snack on while we were decorating the tree, but I didn’t want to spend a lot of time making it, so I came up with this fast and easy recipe for Peppermint Bark Chex Party Mix. 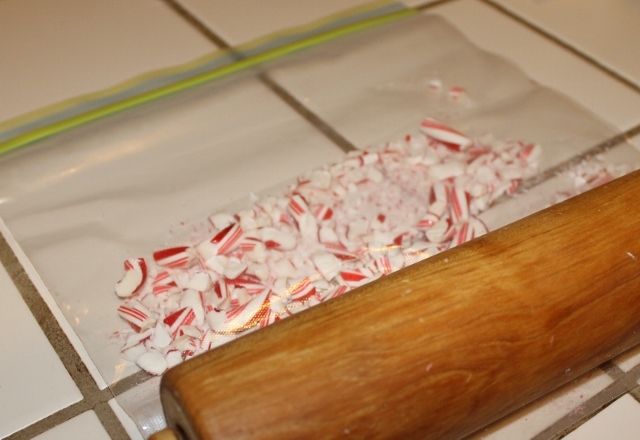 To crush the candy canes without making a mess, place them in a ZipLoc bag and then roll a rolling pin over them. The Rice Chex added a delightful crunch to the peppermint bark and I felt a little less guilty having some vitamin fortified cereal with my candy. Melt the chocolate chips in a microwave safe bowl until melted, approximately 1 1/2 minutes. Stir after a minute. Drizzle chocolate over 3 cups of Rice Chex. Stir to coat. 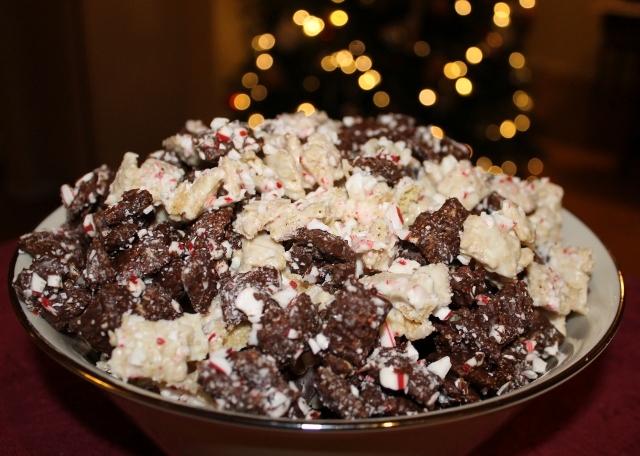 Sprinkle 1/3 cup of crushed candy canes over the chocolate covered Rice Chex. Stir minimally, just enough to stick the candy to the Rice Chex. Place in the freezer for a couple minutes to quickly firm up the chocolate. Melt the white chocolate chips in a microwave safe bowl until melted, approximately 1 1/2 minutes. Stir after a minute. Drizzle white chocolate over the remaining 3 cups of Rice Chex. Stir to coat. Sprinkle the remaining 1/3 cup of crushed candy canes over the white chocolate covered Rice Chex. Stir minimally, just enough to stick the candy to the Rice Chex. Place in the freezer for a couple minutes to quickly firm up the white chocolate. As soon as the chocolate is firm to the touch, combine the chocolate covered Rice Chex with the white chocolate covered Rice Chex. Stir to combine. So creative! This recipe really looks good.